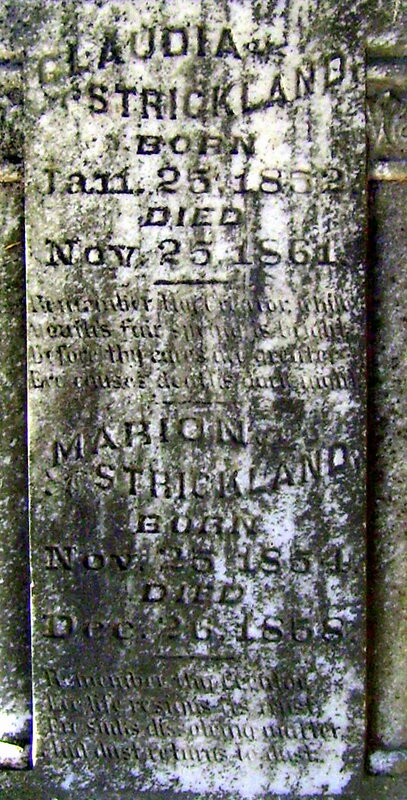 Claudia (1852-1861) and Marion (1854-1858) were children of Bryant E. and Mary Catherine Russell Strickland. The draped urn topped tombstone they share with their father and two brothers bears an epitaph for each from a hymn entitled Remember Thy Creator (author unknown to me). Ere causes death's dark night. And dust returns to dust. 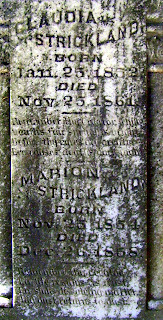 Their father Bryant (1818-1900) has a nice epitaph as well: Earth has the ashes; friends the memory; God the spirit. While the lines are originally based upon Ecclesiastes XII (the first 7 verses), the hymn is sometimes attributed to Samuel Francis Smith. Thanks for the added info, Drew!